Does Your Store Sell “Pink Slimed” Ground Beef? You are here: Home / Rants / Does Your Store Sell “Pink Slimed” Ground Beef? 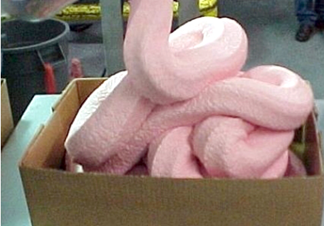 So, we’ve all heard the term “Pink Slime” by now. Lots of discussion about it lately, everywhere you turn! We have also heard that many stores actually sell us pink slime in our ground beef. Sadly, it brings back the days in school when we had to study what is actually allowed to be ground INTO the ground beef and still called ground beef! YIKES! So what is Pink Slime? The "pink slime" is made by gathering waste trimmings, simmering them at low heat so the fat separates easily from the muscle, and spinning the trimmings using a centrifuge to complete the separation. Next, the mixture is sent through pipes where it is sprayed with ammonia gas to kill bacteria. The process is completed by packaging the meat into bricks. Then, it is frozen and shipped to grocery stores and meat packers, where it is added to most ground beef. Ok, so – does your grocery store sell “pink slimed” ground beef? Well, lucky for you – my friend, Ann, over at Coupons, Deals, and More has put together a list of what stores do! that picture is actually chicken used in nuggets, but equally as disgusting. organic 100% ground beef for our family! I buy from a local butcher. I was looking for a picture and all the pink slime stuff had that picture so I thought that was it, oh well! Makes me nauseous every time I hear this. Stats are almost always skewed. My grocers grinds their meat in house. Ask your meat manager if they do as well. Don’t buy the “tube” or pre-packed (offsite) meats to avoid slime. After I seen it on the news last week.. I stopped eating red meat period. Just disgusting.